This month we celebrated the beautiful Royal Wedding of Prince Harry and Meghan Markle. However, you do not need to be royalty to have sparkle at your wedding! 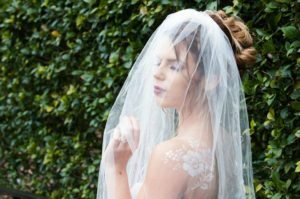 Laine Too​’s temporary body art offers brides, grooms, and guests the chance to feel like royalty. 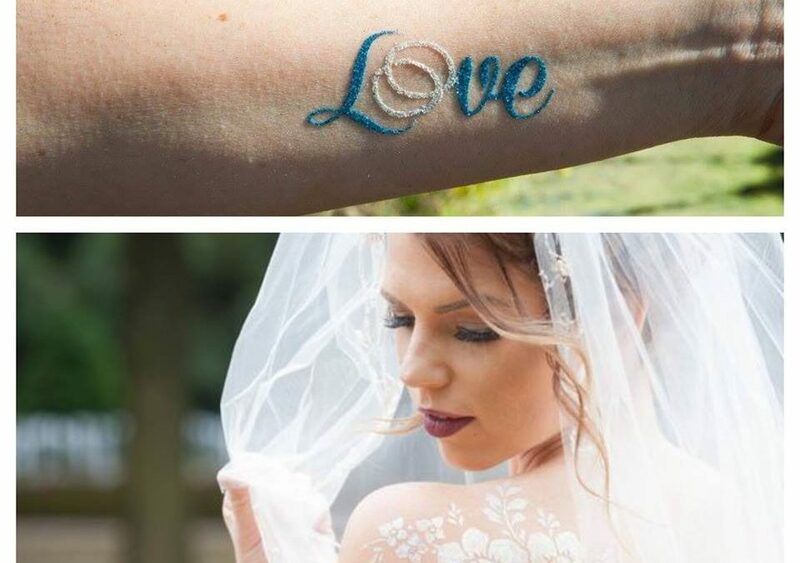 Learn more about using body art to elevate your wedding by with these helpful tips below. Nothing seals a lifelong commitment quite like a matching tattoo with your significant other. However, permanent tattoos are not for everyone. Temporary tattoos allow couples the chance to sport a special symbol on their wedding day and show their devotion to one another. Or, for your “something new” try displaying an elegant piece to compliment your wedding dress. 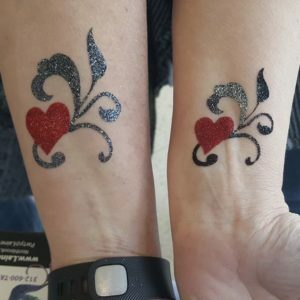 Temporary tattoos, like one pictured below, can be customized to fit your style and act as an eye-catching accessory, sure to have all eyes on you as you walk down the aisle. 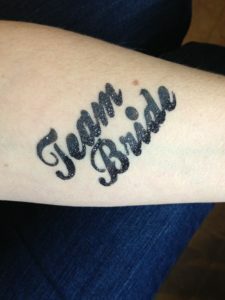 “Team Bride” and “Team Groom” temporary tattoos for your wedding party are a fun way to help them celebrate your big day (as well as showers and stag parties!) and add to the team spirit during fun reception games. In addition, custom manicure artwork is another great finishing touch for bridesmaids. Unique details, such as the couples initials or stunning florals, help bring together the bridal party and creates a special activity for the group to do together to prepare for the big day. Bring guests in on the fun! Add custom printed temporary tattoos to each table that guests can apply themselves. This creates a fun way to celebrate for both adults and children in attendance. 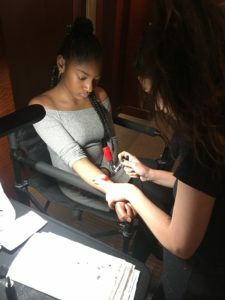 If you are looking to kick it up a notch, try hiring a temporary tattoo artist and setting up a “Tattoo Station.” Not only is this a great way to entertain guests, it will give you and your loved ones fun memories to look back on. Other body art fan favorites for your wedding guests include airbrushing stations, body painting, and henna.